In 1917, the mathematical biologist, zoologist and Classics scholar D'Arcy Wentworth Thompson (1860-1948) published On Growth and Form, a poetic and mathematical study of scale, gravity, order and process. This book lodged itself within the consciousness of twentieth-century sculpture. Henry Moore turned to Thompson's work while studying in Leeds in 1919 and Richard Hamilton, who took the title for his 1951 landmark exhibition at London's ICA, declared On Growth and Form 'charged my batteries for a number of years'. This Gallery 4 exhibition presents a selection of Thompson's teaching models that are held in the collection of the D'Arcy Thompson Zoology Museum at the University of Dundee. 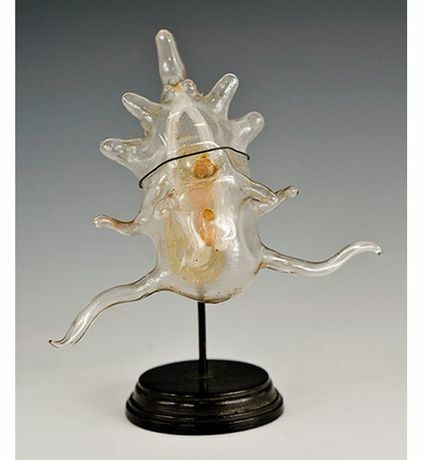 The display includes intricate glass models of jellyfish made in the Dresden Blaschka studio and a series of brightly coloured plaster models of the growth of a primitive vertebrate. These forms Thompson discussed in On Growth and Form, along with soap bubbles, eggs, elephant skulls and narwhal horns. Alongside these models are four 'Transformation' drawings made by Henry Moore in the 1930s. Held in the collection of The Henry Moore Foundation, these show the influence of Thompson on Moore's sculptural thinking, specifically his Theory of Transformations. Here he proposed that physical forces could cause a transformation from one species into another based on mathematical principles. The diagrams that Thompson created to demonstrate this have become among the most iconic images of their type, and they are included in On Growth and Form, which can be found in our Research Library. Until 22 June 2014 D'Arcy Thompson's On Growth and Form is accompanied by Ian Kiaer: Tooth House in Galleries 1, 2 & 3, which presents a series of new works responding to the Institute's galleries. In this exhibition British artist Ian Kiaer proposes different registers of material and objects as models for alternative ways for perceiving growth and form. From 24 July, Gego. Line as Object studies the Venezuelan artist's experimentation with how a line can operate as an object, creating planes, volumes and expansive nets to reflect on perception. Both Kiaer and Gego used On Growth and Form as a central reference in their research relating to the works on display.